If you are a veteran who has been other than dishonorably discharged and is facing homelessness or is currently homeless, Supportive Services for Veteran Families just might be for you! For more information about how SSVF can help you and your family, give us a call at (260) 423-3546, ext. 285. IS SSVF RIGHT FOR YOU? 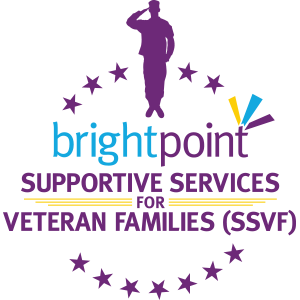 If you have been other than dishonorably discharged from the military and are facing homelessness, please give Brightpoint a call! Here at Brightpoint, we believe that all veterans deserve a stable place to call home. You answered our country’s call. We’ll answer yours! VA benefits info for education, loans, insurance, compensation, employment, etc. Adams, Allen, Blackford, Cass, DeKalb, Delaware, Elkhart, Fulton, Grant, Henry, Howard, Huntington, Jay, Kosciusko, LaGrange, Marshall, Miami, Noble, Pulaski, Randolph, Steuben, St. Joseph, Tipton, Wabash, Wells, and Whitley. Must be discharged (except dishonorably), present a DD-214, and be income eligible. Call (260) 423-3546, ext.285 for additional eligibility requirements. Call your local 211 and ask to do an assessment for SSVF. To ask questions about SSVF, call (260) 423-3546, ext. 285. Call (260) 423-3546, ext. 285, for information about required documentation.